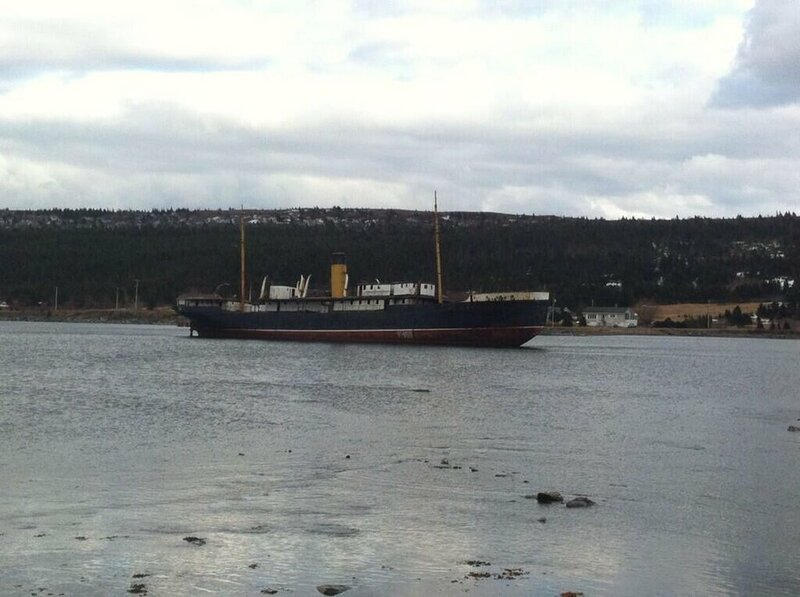 If you've ever been to Harbour Grace, you'll have seen her sitting on the mud flats. If you've ever been to a folk tale or storytelling event, you may have been lucky enough to hear a recitation of the story of her smoke room. This week, we're looking at the story of the SS Kyle. The Kyle was one of the Alphabet Fleet owned by the Reid Newfoundland Company. She was built in Newcastle, England, in 1913. Even though she was from the same fleet as the SS Ethie, there was quite a bit that made her unique. The Ethie and the rest of the fleet had been built in Scotland, while the Kyle was built in England. The Kyle was also designed for Northern waters, and provided Labrador with its first regular coastal service. In order to stand up to the treacherous ice and general unpleasantness of winter weather, she was designed to be an icebreaker. With a rounded stem, she could ride up onto the ice and crack through using her weight. This made her not only an excellent coastal vessel, but a resilient sealer later in her career, and earned her the nickname the "Bulldog of the North". The Kyle and her crew went through their fair share of trials in her over 50 year career. In 1923, during a particularly brutal storm, her Second Officer was swept overboard while clearing ice from her decks. A crewman who was helping him had his leg broken during the same wave. A rescue was discussed, but was deemed too dangerous, and the Second Officer was lost. In 1942, the Kyle tried to come to the assistance of the USS Truxtun as she foundered near Lawn, NL. Try as he might, her captain, Tom Conners, couldn't get near the wreck due to the storm. Not to be deterred, he returned to the town of St. Lawrence and ordered his crew to gather ropes, axes and all the blankets from the ship. Captain Conners then sent his crew to Lawn over land to assist in the rescue of the men of the Truxtun. Retiring from coastal service in 1959, she was sold by the Canadian National Railway (who had bought out the Reid Company years before) to Halifax Shaw Steamships. Under her new owners, she was renamed the Arctic Eagle. She returned to Carbonear in 1961 and was turned into a sealer by Earle Trading Company. They guessed that she could carry around 30,000 seal pelts, and the newspapers said that the black coal on the horizon would be a hit of nostalgia for the older sealers. So, off to the ice fields she went. In 1965 she was caught in a storm that battered her from bow to amidships and cost her owners almost $100,000. At one point she was almost lost in the heavy ice and winds. But the Kyle was made for this, and showed those who doubted her usefulness because of her age that they were wrong by not only making it back to Carbonear, but bringing 12,000 pelts with her. The Kyle wrecked in Harbour Grace. Photo by Heather Elliott. In 1967 she smacked into an iceberg and Earle Co. decided to put her on a sandbar for the winter. She was sailed to Harbour Grace and anchored in the centre of the harbour, considered a safe enough spot for her to ride out the winter months. And for the first bit of the season, she was safe and secure. Unfortunately, Newfoundland winter is rarely kind, and a strong February wind broke her from her moorings, causing her to drag her anchors (or break the chains completely, depending on your source). She drifted all the way down to the end of the inlet, where she was wedged into the mud flats at Riverhead, Harbour Grace. To this day, she still sits there. She has been stripped of her valuable wood and brass fittings over the years, so she really is just the shell of a ship now. That being the case, she is still the pride of Harbour Grace, and was painted up in her original colours so she looks like she did in her prime. Many efforts have been made to try and raise money for a full restoration, but unfortunately none have succeeded. As recent as April of this year the Telegram reported that her future remains uncertain. Her cable room has collapsed into her famous smoke room, and the wreck isn't safe to board anymore. Still, she is a wonderful example of the bygone era of steamships, and for that reason she'll always be one of my favourite Newfoundland wrecks. Modern images are my own. The archival one is from here. I'm also on Twitter! Feel free to follow me!